Just three hours from the Australian mainland, Vanuatu represents the finest example of a South Pacific tropical paradise and offers wonderful experiences to suit every budget and every interest. The beautiful environment and the happy people of Vanuatu make it a truly unforgettable and authentic holiday getaway. Vanuatu is an archipelago of 83 islands – the main islands being Efate (where the capital of Port Vila is situated), Espiritu Santo and Tanna Island. Port Vila is a bustling town set on a picturesque natural harbour. Most hotels and resorts are located within a few kilometres of the main town making it easy to venture out and explore this pretty town and surrounds. Stroll the seafront, buy handicrafts and sample fresh produce at the local market, dine out at wonderful restaurants and cafes, enjoy the bars and fun nightlife, shop the duty free stores and boutiques, or explore further afield. Hideaway Island and Mele Cascade Waterfalls are popular day trips or you can choose from a vast array of tours and activities on offer – beaches and water sports, day cruises, scuba diving and snorkelling trips, round island tours, cultural villages, bush walks, game and sports fishing, golf, buggy adventures and much, much more. Tanna Island is a 35 minute flight south of Port Vila and home to Mount Yasur Volcano, one of the world’s most accessible active volcanoes. Experience the thrill of standing on the crater rim (dependent upon activity) and feel the earth rumble beneath you as red glowing lava shoots skywards. This is nature at its breathtaking best. Visit traditional villages and witness an ancient culture that has remained largely unchanged for centuries, discover underwater caves and snorkel pristine waters. Tanna is a raw and magical place and highly recommended for those seeking an authentic cultural and adventure experience. Espiritu Santo is a 40 minute flight north of Port Vila and is the largest of Vanuatu’s islands. Santo offers an unspoilt environment and boasts stunning white sand beaches, crystal clear springs (blue holes), jungle treks, custom villages, WWII history and relics, and world class snorkelling and diving including Million Dollar Point and the famous SS President Coolidge. Santo is an untouched paradise waiting to be discovered. 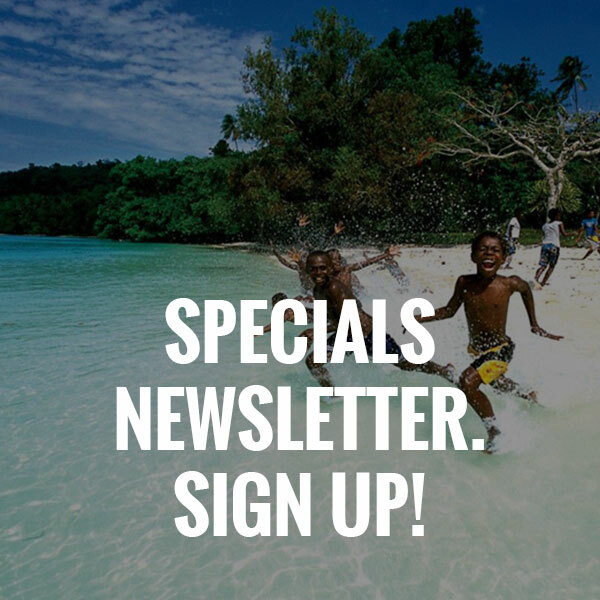 Vanuatu offers something for everyone and we can tailor a package to suit your personal style and budget.